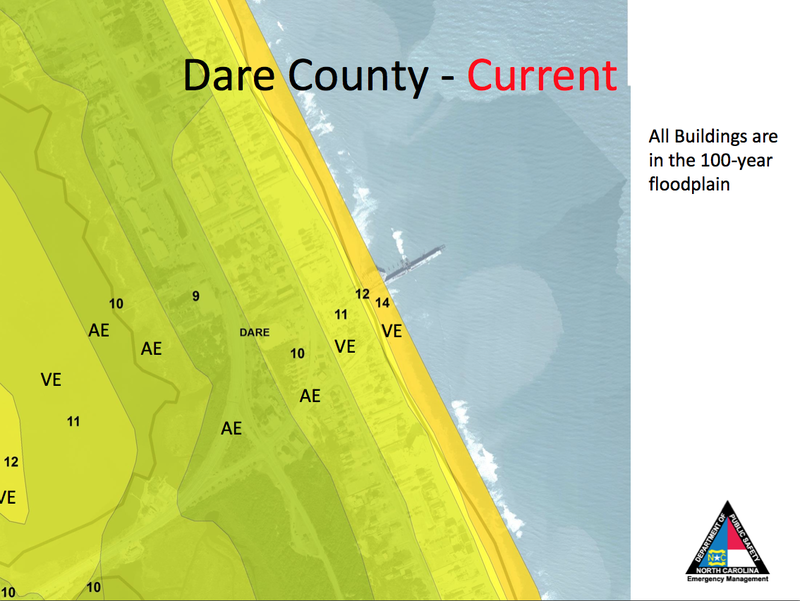 Have We Been Overestimating Flood Risk On The Outer Banks? A preliminary projection of what areas will see gains and reductions in base flood elevation. The Outer Banks are seeing drastic changes to the level of understood flood risk. Only it's not the change they were expecting. It would be easy to look at the newest round of floodplain maps and think that we've been wrong about the Outer Banks all this time. For the past decade, the standard line has been that things on the coast are getting worse. Sea levels are rising; the shoreline is eroding; flooding is becoming a bigger threat. 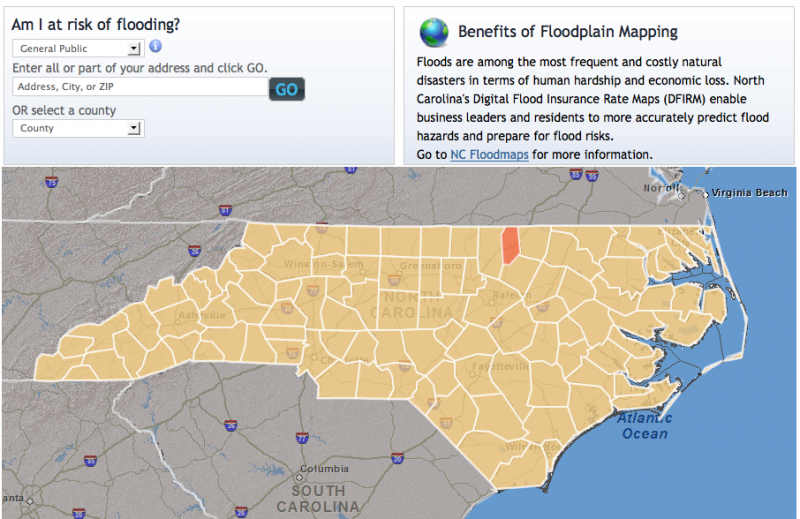 Flood risk is largely determined by a series of maps produced by the state of North Carolina. Those maps then make their way to FEMA, who administer the National Flood Insurance Program. Basically, the higher your risk, the more you pay in flood insurance. So with the specter of more risk and higher insurance rates hanging over their heads, coastal Carolinians have been understandably anxious about what these new maps would say. "There is a significant number of properties coming out of the flood zone on the coast," said John Dorman, director of the state’s flood mapping division, in the Department of Public Safety. In a presentation prepared by officials at the floodplain mapping program, preliminary maps show the majority of coastal counties having a net decrease in properties in the two flood hazard zones; The VE and AE zones. The VE zone is where, if there were a catastrophic storm, you’d literally have a wave crashing into your building. The AE zone is where you may not have waves, but you would likely have storm surge rising up into your structure. 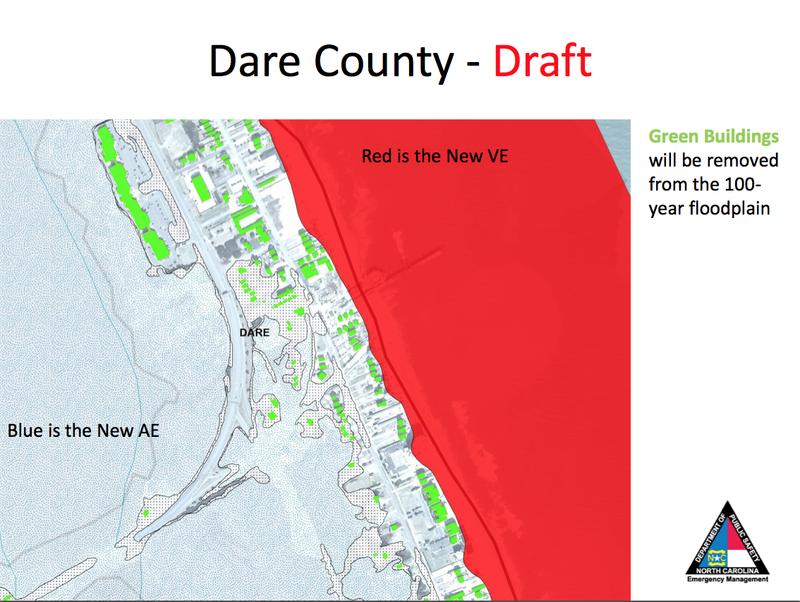 The most drastic changes are happening in Dare Country, where roughly 18,400 properties will come out of the flood hazard area, if the maps are approved. "Two-thirds of our structures are being removed from the 100 year flood plain," said Willo Kelly, the Government Affairs Director for the Outer Banks Association of Realtors. "And to hear that two-thirds of your structures are no longer going to be required to carry flood insurance if they have a mortgage, just seems completely unbelievable." The proposed newest floodplain map shows some of the building that could be removed from the hazard zone. Some are homes, others are restaurants and businesses. At first glance, it's unbelievable to many. The idea that the Outer Banks is actually becoming a safer place to live seems completely counterintuitive. But Gavin Smith of the U.S. Department of Homeland Security's Coastal Hazards Center thinks the change isn't in the geology, it's in the mapping technology. "The maps that were created before these maps were perhaps not the best baseline data upon which to craft policy," said Smith. That's because the technology has increased dramatically since the mid-2000s, when the last round of maps rolled out. Think about it like going from a standard-defintion television, to a high-def screen. Using a technique called LIDAR, cartographers fly planes over the area they want to map, and shoot little beams of light down to the ground. The light reflects, bounces back up to the plane, and the time it takes to travel tells how high or low the elevation of that spot is. We have an order of magnitude more data to pull from. So while it's always been risky, the earlier data was probably not doing a very good job conveying that risk. So now, we have tens of thousand of policy holders who, depending on the flexibility of their mortgage lender (you're only required to have flood insurance if you have a mortgage), may have the option of dropping coverage. 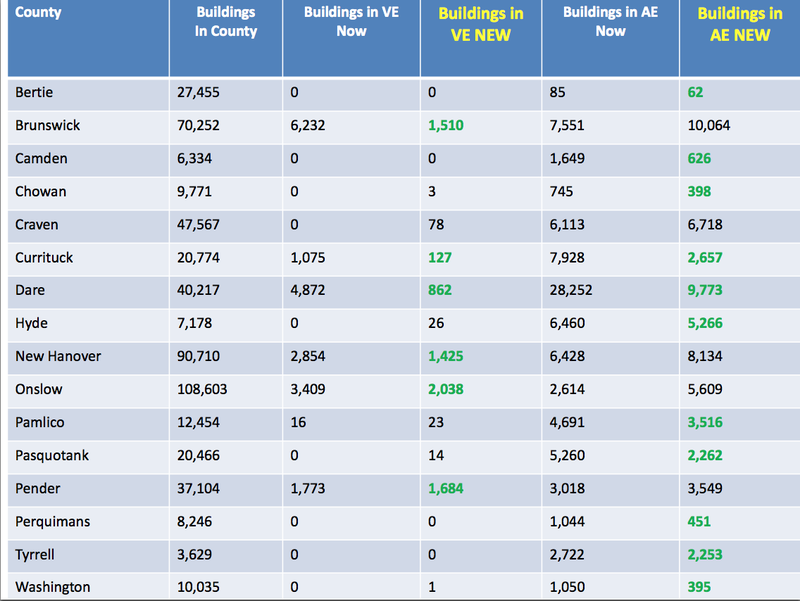 A preliminary look at the number of buildings entering an leaving the flood zones by county. Is Flood Insurance A Good Investment? Dropping coverage is something no one in any official capacity wants to see happen. Representatives from FEMA, the state of North Carolina, Dare County, UNC, and the Outer Banks Association of Realtors, all suggested that it is most responsible for people on the Outer Banks to continue coverage, even if not required. They plan to continue educating people on the benefits of owning flood insurance (it's partially a requirement for municipalities who take part in the National Flood Insurance Program). But, for many, it simply comes down to dollars and cents. Barbara Davis, a waitress in Nags Head, says in 30 years on the Outer Banks, she's never had to file a claim. "I think it's a waste of money," said Davis, who spends about $650 a year on insurance (she says her annual income is roughly $35,000). She said she'd love to stop paying for flood insurance if it were an option. For its part, FEMA, who runs the National Flood Insurance Program, says the best insurance policy is one you never have to collect on. And, frankly, FEMA needs a little less collecting. The flood insurance program is $24 billion in debt, with no clear path as to how it will get out. Because of development, big storms are doing more damage in terms of dollars. And, now, with these maps, a lot of policyholders may have the option to stop paying. There's also the risk that having lower requirements to purchase insurance, and being required to build to lower heights in order to meet those requirements, could encourage more risky development than might have been an option before. Gavin Smith, of the Coastal Hazards Center, also points out the fluidity of the Outer Banks' geology. "The seas are rising," said Smith. "Storms are becoming more intense. Yet we don't have a tried and true metric to measure that change. And until we understand and reconcile those changes, we are, in some ways, not telling the full story." These maps are still preliminary, and need approval from FEMA before anything becomes official. Which means they haven't been released to the public yet - only the anticipated raw building numbers have. So, for now, the story is simply that we know more than we ever have before about where it is and is not supposed to flood. Hopefully we haven’t learned too much for our own good. This month, North Carolina launched FRIS, the Flood Risk Information System. It's the first system of its kind in the country to put all of the state's flood risk data, county-by-county, building-by-building, into one digital initiative. It's not the prettiest map ever designed, but it's full of all sort of information that used to require a lot of manpower to produce for whoever wanted it. 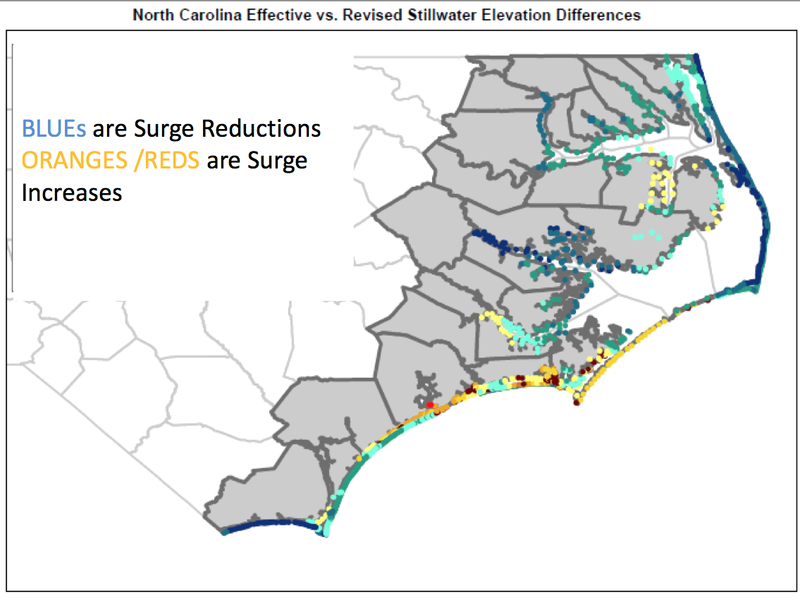 Researchers at UNC-Chapel Hill are using storm surge data to give coastal communities a better idea of what they can expect during hurricanes. The university's Renaissance Computing Institute, or RENCI, has a network called the Surge Guidance System. 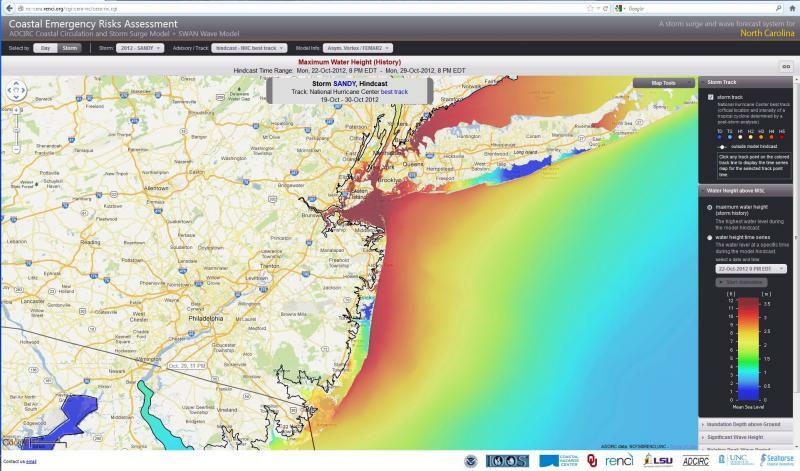 It gathers intricate details of ocean activity to calculate where, how and when storm surge will affect certain areas.